For a bride awaits him, young and fair. Then departed with a fair good-night. ..."
The verses above are translated from Goethe's poem, Die Braut von Korinth (in Volume 9 of Nathan Haskell's 19th Century English edition of his collected works), but the story Goethe tells is a much older one, originally collected by Phlegon of Tralles (a freedman of the Emperor Hadrian) in the 2nd Century AD. It is, perhaps, the oldest surviving ghost story in the European literary tradition. The opening of Phlegon's story is missing, but its sense is clear enough. What follows is my own free re-telling of it. The young man, Machates, exhausted by his travels, had little appetite for the food and wine left by his prospective mother-in-law, Charito. Still fully clothed, he lay down on his bed and fell asleep. He was awoken during the night by a creaking of the door and, by the glow of the waning lamp placed beside his bed, he saw a young girl at the door, in a white dress and with a black and gold band around her forehead. "I am sorry," said the maiden. "Nobody told me that we had a guest. I will leave you to sleep." But Machates, enchanted by her beauty, had risen to his feet. "Please stay," he insisted. "There is wine and food that we can share. My name is Machates. I think we are betrothed." The damsel smiled at him. "I am Philinnion," she said, sitting down on the bed beside him. Machates poured a cup of wine and handed it to her. She drank eagerly from it, then handed it to him. Merely to place his lips where hers had been sent him into a rapture of ecstasy. He offered her bread and olives, but she said she was not hungry. They talked late into the night. Suddenly she placed her finger to his lips. There was a rustling outside the bedroom door. "One of the slaves must have heard us," she whispered in his ear. They held each other in a silent embrace. Through a chink in the door, they saw the light of two lamps. When they had gone, and the rustling ceased, Philinnion stood up. "My parents should not know of my visit to you," she insisted. "For they deserve the honour of introducing us." She took a silk scarf from her bosom and wrapped it around his neck, and a gold ring from her finger, which she placed on his. He went to his chest and took out a silver cup, a family heirloom from the time of the Divine Augustus. He presented it to her, along with an iron ring from his own hand. She asked if she might take with her a lock of his hair. He reached for his razor and cut one for her. "I will come to you again tomorrow evening," she whispered. Bidding him good night, she slipped quietly out of the door, anxious not to wake her parents or their slaves. When he awoke in the morning, he placed the scarf and the ring in his travelling chest, and was about to go downstairs. There was a knock on the door, and Charito entered with two of her maids. Charito gestured to one of them. "Fortunata heard you talking to a woman last night," she said. "I must ask you who it was." Machates blushed. "It was your daughter," he admitted. "My betrothed. I swear by all the gods that I laid not a hand on her. We merely introduced ourselves and supped together." "Did she tell you her name?" Charito asked. He watched as Charito turned quickly to Fortunata, both womens' mouths falling open, gazing at each other at each other, dumbstruck. "Philinnion is not your betrothed," said the other slave. "It is to her sister you are plighted." Charito started wailing and tearing at her hair. The two slaves ushered her from his room. He began to wonder if he had entered the house of a mad woman. All that day, Machates wandered in the garden, catching not a glimpse either of Philinnion or her un-named sister. At noon he fetched a writing tablet and stylus from his room, and sat down at the foot of a pear tree to write a letter to his father, telling of his love for Philinnion, and asking that the arrangements be changed so that he could marry her. 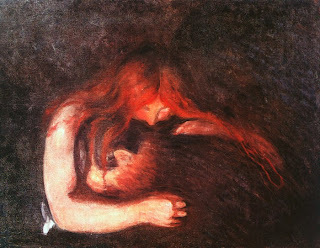 After he had retired for the evening, Philinnion came to him again, as she had promised, and climbed into bed with him. He took her in his arms and made love to her with passion. But they were disturbed by a sharp rap on the door. Charito entered with her husband, Demostratus. They gazed in astonishment at their daughter. "How dare you defile your sister's marriage bed?" Charito shrieked. "You have no right even to be here." Machates put a protective arm around he shoulder, but she shook him off and stood to face her parents. "Mother and Father," she said, calmly. "You are both cruel and unjust, that you begrudge me just three nights of love, here beneath my father's roof. Now, because of your busy curiosity, you shall be made once again to mourn. But for me, I return to my appointed place, for you cannot think that I came here without the assistance of the gods." Philinnon, having spoken, collapsed onto the bed. Machates felt for her pulse, found none, realised that her flesh was cold. He stared up at her parents. "What have you done?" he cried. "You have killed your daughter with your words." "Words cannot kill," Demostratus insisted. "And you saw for yourself that neither I nor her mother laid hands on her. In any case, how could we kill her, when we ourselves have buried her these six months since?" Distraught, Machates spent the morning in the garden, whilst Demostratus's male servants searched the family vault. Fortunata sought him out and told him that all of the bodies had been found in their allotted places, with the exception of Philinnion's. "These were found where that had lain," she added, handing him the iron ring and silver cup that he had given to his dead lover when they had first met. 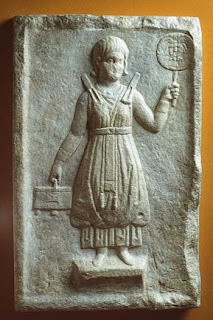 Grave-stone of a Roman girl of the 2nd Century AD, from Virunum, Austria. Photo: O. Harl (licensed under CCA). 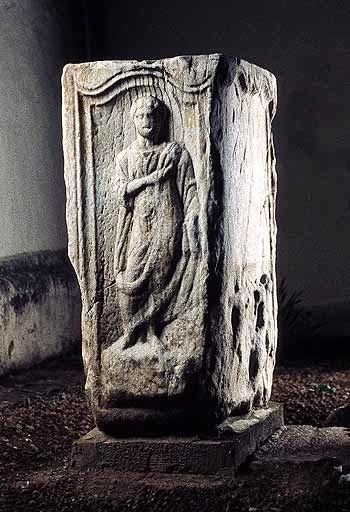 Machates ran from the house and through the streets of Corinth until he came to a steep wooded slope. He climbed it, and there looked down on the city. He watched as the body of Philinnion was carried to be cremated outside the walls of Corinth. As the smoke rose from the pyre of her second funeral, he heard her voice call to him. Unwilling to live without her, he took his dagger from his belt and fell upon it. Grave-stone of a Roman girl from Stallhofen, Austria. Photo: O. Harl (licensed under CCA). "Mother, to this final prayer give ear! That the flames may give the lovers rest! To the gods of old we'll hasten, blest." 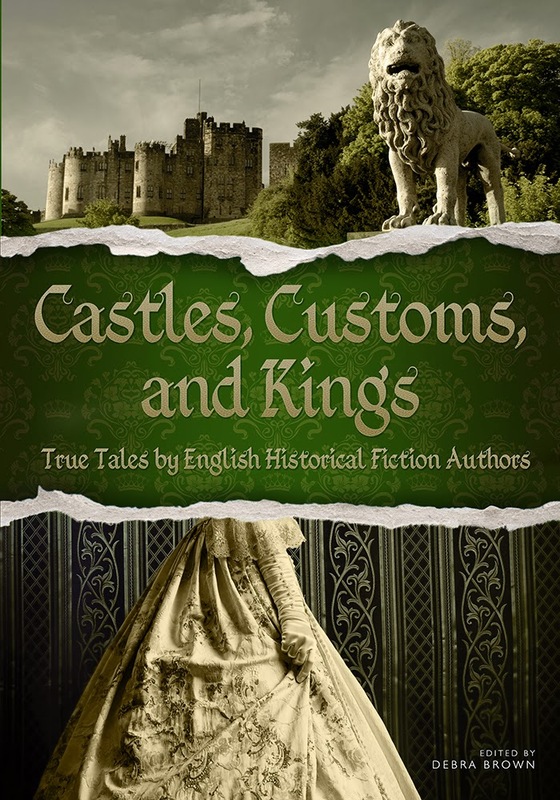 Castles, Customs and Kings, True Tales by English Historical Fiction Writers, edited by Debra Brown and M.M. Bennetts and published by Madison Street Publishing, is a miscellany of non-fiction articles written by historical novelists, not all of whom are English (the selection also includes articles by Scottish, Welsh, Irish, American, Canadian and Australian authors), and covering all aspects of British, rather than solely English, history. All of the articles appeared originally on the English Historical Fiction Authors' Blog (http://englishhistoryauthors.blogspot.com), a website to which I now contribute. This volume, however, does not include any of my articles, because its contents are drawn from the first year of the blog's existence (September 2011-2012) before I joined the team. The editors' aims are set out in the introduction. "The authors of this book are, for the most part, historical fiction writers. To create good historical fiction, we have studied the times of which we write, and the events that came before. We would like to share some of the fascinating things we have learned..."
It's an urge that I well understand. In the course of my own research over the past year for my next novel, and for a series of short stories, documents that have crossed my various desks at the British Library, the National Archives and the London Metropolitan Archives have included the 12th Century manuscript of the Liber Sancti Jacobi, giving details of the pilgrimage to Santiago de Compostella (I went back to the original manuscript because historians agree that the only complete translation is deeply flawed); Medieval penitentiaries (used by priests to set penances for sins); service records from the Metropolitan Police in the late 19th and early 20th Century); and Royal Navy muster lists and log books from the 18th Century. Only a tiny portion of what I gleaned from these documents will ever find its way directly into my fiction. We are distillers, not regurgitators, of history. I asked editor, Debra Brown, what makes for a good blog post, given that it is a relatively new literary form which, like the tweet, did not exist when she and I were first reading. "....the posts, for the most part, are a report of historical events.." she replied. "On many blogs, historical topics are debated, as we have seen with the differences of opinion on the character of Richard III...authors using different resources...may offer different points of view." To my mind, blog-posts tend to be read rather more casually than more conventional forms of non-fiction. They need to be short and to the point (capable of being read and absorbed in the time it takes, or perhaps half the time it takes, to drink a cup of tea or coffee) and, as Debra hints, it is no bad thing if they encapsulate a note of historical controversy and (in the context of historical fiction writers), if we give clues as to why we wrote our characters and scenes in the way that we did, in the full knowledge that this represents only one possible interpretation. Blogs are an opportunity for us to "show our workings," to reveal the complexities that few fiction readers want to see in a footnote or an endnote. The contributions to the book cover the full scope of the British past, from prehistory to the 20th Century. 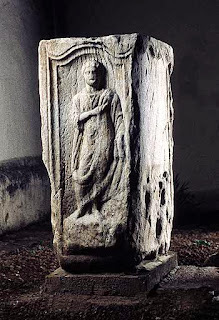 Among my favourite articles are Richard Denning's, on the first written word in English (runes on the bone of a deer from Caistor St Edmund in Norfolk, perhaps scratched by a Saxon mercenary in c420 AD); Roseanne Lortz's on The Venerable Bede and the origins of the modern western calendar; and Carol McGrath's discussion of the Christmas of 1065 and the iconography of the Bayeux Tapestry. 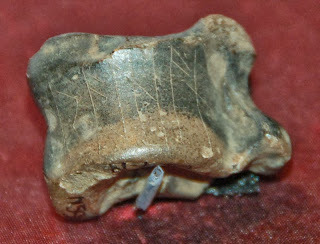 Inscribed deer-bone from Caistor St Edmund. The runic inscription reads "from a roe." The death of Edward the Confessor, as depicted on the Bayeux Tapestry: one of the turning points of English History. There are even recipes (Katherine Ashe tells us how to re-stage a feast from 760 years ago, including galantine sauce for fowl, meat and fish, pease pottage and mawmange of lamb and lentils - I am thinking of this for Christmas 2013, if a certain person can be persuaded to join me...). It is a book to dip in and out of, rather than read from cover to cover. It makes no claim or attempt to be a substitute for academic works of history, but it offers some fascinating insights. 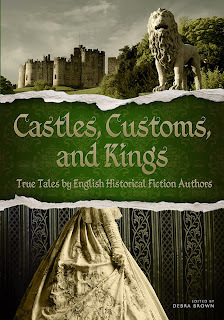 Castles, Customs & Kings, True Tales by English Historical Fiction Writers, is published by Madison Street Publishing, and can be purchased from www.amazon.co.uk and www.amazon.com. Julian Fellowes on Shakespeare: Wrong, Wrong, Wrong! In today's Guardian, the screenwriter, director, novelist and Conservative peer, Julian Fellowes, is reported (www.theguardian.com/stage/2013/oct/14/globe-theatre-julian-fellowes-shakespeare) as saying that Shakespeare's plays, in their "unchanged form," are inaccessible to those who have not had "a very expensive education" such as his own (Ampleforth and Magdalene College, Cambridge). He made these remarks following the UK launch of his screen adaptation of Romeo and Juliet, on which I will not comment, since I haven't yet seen it, although it has been criticised for rewriting Shakespeare's original text. I have no problem with adaptations, however loose, of "classic" works. With my own students, I explore The Island, a very free-flowing South African adaptation of Sophocles's Antigone, by Athol Fugard, John Kani and Winston Ntshona. There is a place for such adaptations, and no doubt for Fellowes's Romeo and Juliet as well. I have a big problem, however, with the notion that "unadulterated" Shakespeare is accessible only to a small cultural elite. Unlike Fellowes, I did not go to an expensive private school. My sister and I were educated in the state sector. When she was thirteen, my sister decided that it was time to dip into Shakespeare. She took a volume from the school library (I can't remember whether it was Romeo and Juliet or A Midsummer Night's Dream). The librarian refused to issue it to her on the grounds that she was "too young." When she mentioned this to her English teacher, he promptly went into the library, borrowed the volume on his own ticket, and placed it in her hand. She loved it, and has been passionate about Shakespeare ever since. No doubt her teacher had to explain some of the language and concepts to her. That's what good teachers do, whether in the state or the private sector. Like Fellowes, I did go to Cambridge, so I suppose I have had a privileged education, but that's not where I developed my appreciation of Shakespeare and the other classics of English literature. I studied Archaeology and Anthropology. Cambridge, however, had no entrance exams for these subjects, so I sat my papers in English Literature (including a Shakespeare paper), Geology and Classics. It was my passion for Shakespeare (fostered by teachers in the state education sector) that helped me to access the privileged environment of Cambridge, not vice versa. 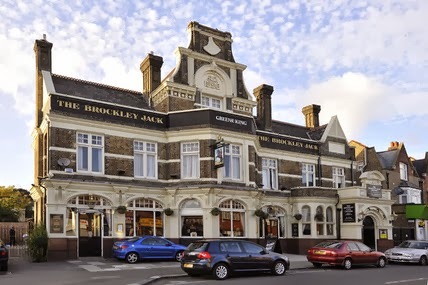 Near to my home is the Brockley Jack, a pub with a small theatre attached. Their productions, many of them amateur, include Shakespearean works as well as original new work by local writers. It is very much a community venture, and holds only a small audience. At a recent production (minimally adapted, if at all) of Julius Caesar, I recognised the local plumber, the taxi-driver who took me to the airport for my last long-haul trip, and a woman who serves in the local supermarket. I know that there are similar small theatres the length and breadth of the country which do remarkable work and reach very wide audiences. 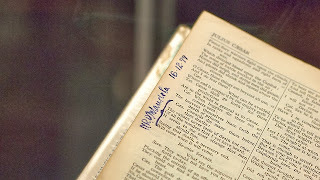 One of the most moving exhibits in last year's British Museum exhibition on Shakespeare was the "Robben Island Shakespeare" volume, which was circulated secretly among the political prisoners of the Apartheid era, annotated by many of them, and used to improvise the performances that allowed them to keep a sense of proportion under the most appalling circumstances. Few of these men and women can have had the sort of "expensive education" of which Fellowes writes. I do think that our education system sometimes ruins the experience of Shakespeare for young people by insisting that they "read" texts that were always intended to be performed by skilled actors. There is a case for line-by-line analysis, but I'm firmly of the view that a young person's first experience of any dramatic text (as distinct from a novel or poem) should be a performance. Whilst live performances may be a "gold standard," televised versions (which do not need to be heavily adapted, and certainly not "dumbed down") allow the teacher to pause and explain where necessary. Among my earliest Shakespeare memories from school are the BBC versions of Macbeth (starring a very young Ian McKellan and Judi Dench), and Twelfth Night (starring Robert Hardy and Felicity Kendall). These early experiences have remained with me for a lifetime, and are etched indelibly on my mind. At a recent live performance of Twelfth Night (starring Mark Rylance and Stephen Fry) a close friend and I suddenly glanced at each other as we realised, simultaneously, that a line from the play had found its way, almost verbatim, into my novel, Undreamed Shores, without my having any awareness that I had been citing it. There are those, of course, who believe that William Shakespeare (the actor from Stratford-upon-Avon) cannot possibly have written the works of "Shakespeare" because he had not, himself, received a sufficiently expensive education to have set him up for the task. They are, I believe, as wrong-headed as those who now argue that only a small elite can ever be capable of understanding his works as he originally wrote them.